Unser Geburtstagsmonat bei den Daring Cardmakers neigt sich dem Ende zu. Und ganz zum Schluss ist mein Lieblingsthema dran: Halloween! Tando Creative hat uns mit ganz phantastischen Chipboards versorgt. Außerdem habe ich mit meiner neuen Hexen-Wäscheleinen-Stanze gespielt, die ich mir beim Stempel-Mekka gegönnt habe. Perfekt wäre natürlich eine halloweenige Geburtstagskarte gewesen, aber ich hatte einfach keine richtige Idee dafür. Auch diese Woche gibt es nochmal was zu gewinnen: Chipboard von Tando und ein Stempelset von Imagine That! Und dann gibt es noch ein paar Extra-Preise. Und dafür braucht ihr noch nicht mal eine Karte zu zeigen sondern müsst nur an unserem Blog-Hop teilnehmen. The Daring Cardmakers birthday celebrations are slowly coming to an end. And we saved the best for last – my alltime favourite: Halloween! Tando Creative have generously equipped us with some really gorgeous chipboard. Also I took the chance to play a little with my brand new witches-laundry-line-cutting die. The perfect thing of course would have been to create a halloween-style birthday card, but I just couldn’t come up with a decent idea. And there’s prizes to be won again: Chipboard byTando and a stamp set by Imagine That! Es gibt eine neue Challenge ganz nach meinem Geschmack: an jedem 13. eines Monats heißt es ab sofort spooky & scary! Das erste Thema ist der gute alte Totenkopf. A new challenge has just started that is just to my liking: spooky & scary is the word on every 13th of a month from now on. The first topic is the good old skull. The text translates “damned axe” which is sort of a mild swearing expression. I liked the idea of combining the skull with the thought of a deadly blade. 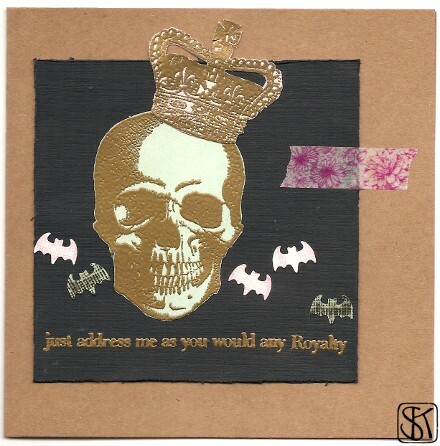 Hallowe’en-colors are currently called for at Fashionable Stamping Challenges. It was rather by coincidence that last year’s distress ink fall-colors found their way to my desk. I didn’t think I’d ever need any other orange-colored ink-pad other than my beloved “spiced marmalade” – but well, I’ve made up my mind….. 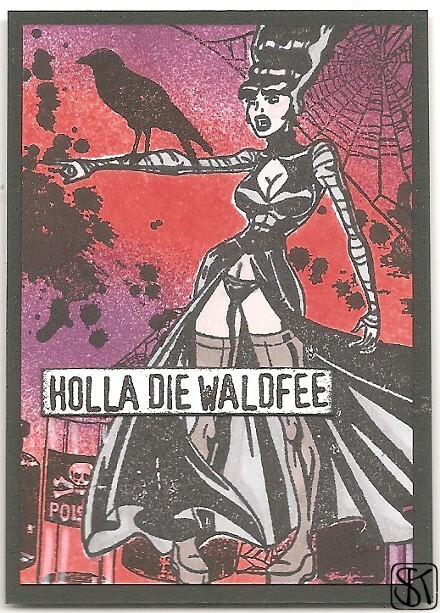 The text translates “Holla! The forest-fairy!” which doesn’t actually mean anything at all but is an expression of surprise / astonishment. Das ist das Thema der Woche bei Think Monday – Think ATC. 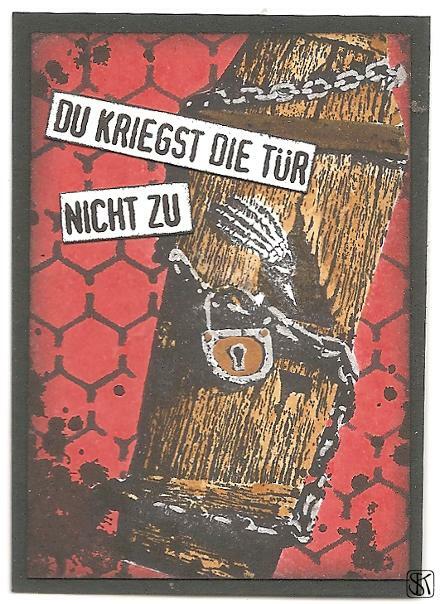 Hier meine letzten beiden 2011er ATCs zu diesem Thema. Bei The Octopode Factory Friday sind diese Woche Häuser gefragt. Und das tolle Spukhaus von Katzelkraft hat es mir wirklich angetan. The current Octopode Factory Friday challenge is “houses”. And I’m definitely in love with that haunted house by Katzelkraft. Bloß keine Karte! Das ist die aktuelle Herausforderung bei der Fashionable Stamping Challenge. Auch da habe ich etwas Hallowe’eniges für euch im Angebot. Schönen Gruß an Silvia – sie hat wesentlich zu dieser Box beigetragen, weil sie auch im März ganz selbstverständlich Fledermausstempel zur Hand hatte. Anything but a card. That’s the current Fashionable Stamping Challenge. And of course I’m staying with Hallowe’en as a theme here, too. Cheers to Silvia – she had a great part in the making of this box, having (what else?) bat-stamps at the ready even in march. 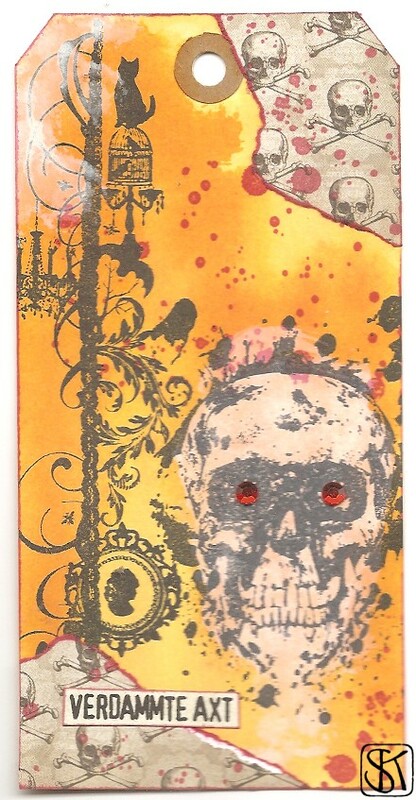 Das ist das Thema der Woche bei Sunday Postcard Art. 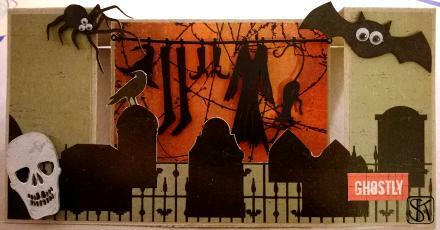 Haunted Houses are this week’s challenge at Sunday Postcard Art. The text is a pun. It means “When death comes, you’re done.” But the “you’re done” bit uses the German word for a scythe. So literally it would be something like “When death comes, it’s scythe”.